My latest article is all about kisses…. the chocolate kind! Love the tradition and the idea behind them! They look amazing too! I have always loved those candies. I have never tried making my own, however. I love a new project! Thanks. Yum!! I’ve never made chocolate candy at home. These look so cute! How did you find the recipe?! Or was it trial and error? Great story. I just got back from Penang, Kuala Lumpur and Singapore where there were Valentine’s cards/candies and gifts galore. So I think maybe this is a worldwide trend …. 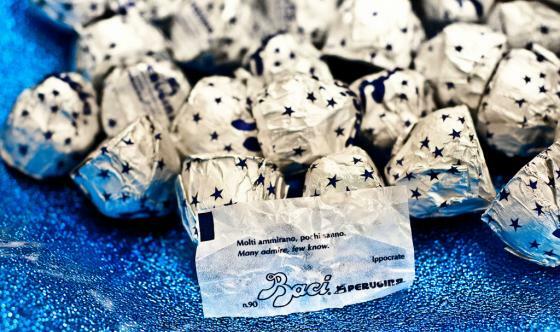 You know how I am about hiding Baci chocolate… you never know when I am going to find them. Lucky for me, I put them in a safe hiding place , away from my husband but always leave a little note attached with a date of when they have been hidden away. A nice surprise for sure. Just in case he finds that secret hiding place, I wlll know what to do. Love this! Can’t wait to give this a try. I know exactly who is going to test this recipe first! haha! Great job! Homemade kisses! What could be better? These are gorgeous! What a great homemade gift idea.